The Book of Hosea is one of the books of the Hebrew Bible. According to the traditional order of most Hebrew Bibles, it is the first of the twelve Minor Prophets. Hosea (הושֵעַ) prophesied during a dark and melancholic era of Israel's history, the period of the Northern Kingdom's decline and fall in the 8th century BCE. The apostasy of the people was rampant, having turned away from God in order to serve both the calves of Jeroboam and Baal, a Canaanite god. During Hosea's lifetime, the kings of the Northern Kingdom, their aristocratic supporters, and the priests had led the people away from the Law of God, as given in the Pentateuch. Forsaking the worship of God, they worshiped other gods, especially Baal, the Canaanite storm god, and Asherah, a Canaanite fertility god. Other sins followed, including homicide, perjury, theft, and sexual sin. Hosea declares that unless they repent of these sins, God will allow their nation to be destroyed, and the people will be taken into captivity by Assyria, the greatest nation of the time. The prophecy of Hosea centers around God's unending love towards a sinful Israel. In this text, God's agony is expressed over the betrayal of Israel. Stephen Cook asserts that the prophetic efforts of this book can be summed up in this passage "I have been the Lord your God ever since the land of Egypt; you know no God but me, and besides me there is no savior" (Hosea 13:4) Hosea's job was to speak these words during a time when that had been essentially forgotten. The Book of Hosea contains a number of YHWH prophecies and messages for both Judah and Northern Israel (Samaria). These are delivered by the prophet Hosea. Chapters 1–2; Account of Hosea's marriage with Gomer biographically which is a metaphor for the relationship with YHWH and Israel. Chapters 4–14:9/14:10; Oracle judging Israel, Ephraim in particular, for not living up to the covenant. No further breakdown of ideas is clear in 4–14:9/14:10 Following this, the prophecy is made that someday this will all be changed, that God will indeed have pity on Israel. Chapters 4–14 spell out the allegory at length. Chapters 1–3 speaks of Hosea's family, and the issues with Gomer. Chapters 4–10 contain a series of oracles, or prophetic sermons, showing exactly why God is rejecting the Northern Kingdom (what the grounds are for the divorce). Chapter 11 is God's lament over the necessity of giving up the Northern Kingdom, which is a large part of the people of Israel, whom God loves. God promises not to give them up entirely. Then, in Chapter 12, the prophet pleads for Israel's repentance. Chapter 13 foretells the destruction of the kingdom at the hands of Assyria, because there has been no repentance. In Chapter 14, the prophet urges Israel to seek forgiveness, and promises its restoration, while urging the utmost fidelity to God. Matthew 2:13 cites Hosea's prophecy in Hosea 11:1 that God would call His Son out of Egypt as foretelling the flight into Egypt and return to Israel of Joseph, Miryam, and the infant Yeshua. The capital of the Northern Kingdom fell in 722 BCE. All the members of the upper classes and many of the ordinary people were taken captive and carried off to live as prisoners of war. First, Hosea was directed by God to marry a promiscuous woman of ill-repute, and he did so. Marriage here is symbolic of the covenantal relationship between God and Israel. However, Israel has been unfaithful to God by following other gods and breaking the commandments which are the terms of the covenant, hence Israel is symbolized by a harlot who violates the obligations of marriage to her husband. Second, Hosea and his wife, Gomer, have a son. God commands that the son be named Jezreel. This name refers to a valley in which much blood had been shed in Israel's history, especially by the kings of the Northern Kingdom. (See I Kings 21 and II Kings 9:21–35). The naming of this son was to stand as a prophecy against the reigning house of the Northern Kingdom, that they would pay for that bloodshed. Jezreel's name means God Sows. Third, the couple have a daughter. God commands that she be named Lo-ruhamah; Unloved, or, Pity or Pitied On to show Israel that, although God will still have pity on the Southern Kingdom, God will no longer have pity on the Northern Kingdom; its destruction is imminent. In the NIV translation, the omitting of the word 'him' leads to speculation as to whether Lo-Ruhamah was the daughter of Hosea or one of Gomer's lovers. James Mays, however, says that the failure to mention Hosea's paternity is "hardly an implication" of Gomer's adultery. Fourth, a son is born to Gomer. It is questionable whether this child was Hosea's, for God commands that his name be Lo-ammi; Not My People, or more simply, Not Mine. The child bore this name of shame to show that the Northern Kingdom would also be shamed, for its people would no longer be known as God's People. In other words, the Northern Kingdom had been rejected by God. Also, God says that "I am not your I am"; in other words, God changes His own name in connection with his current relationship with Israel. In Hosea 2, the woman in the marriage metaphor could be Hosea’s wife Gomer, or could be referring to the nation of Israel, invoking the metaphor of Israel as God's bride. The woman is not portrayed in a positive light. This is reflected throughout the beginning of Hosea 2. “I will strip her naked and expose her as in the day she was born” (Hosea 2:3). “Upon her children I will have no pity, because they are children of whoredom” (Hosea 2:4). “For she said, I will go after my lovers...” (Hosea 2:5). Tristanne J. Connolly makes a similar observation, stating that the husband-wife motif reflects marriage as it was understood at the time. Connolly also suggests that in context the marriage metaphor was necessary in that it truly exemplified the unequal interaction between Yahweh and the people Israel. Biblical scholar Michael D. Coogan describes the importance of understanding the covenant in relation to interpreting Hosea. According to Coogan, Hosea falls under a unique genre called “covenant lawsuit” where God accuses Israel of breaking their previously made agreement. God’s disappointment towards Israel is therefore expressed through the broken marriage covenant made between husband and wife. Brad E. Kelle has referred to 'many scholars' finding references to cultic sexual practices in the worship of Baal, in Hosea 2, to be evidence of an historical situation in which Israelites were either giving up Yahweh worship for Baal, or blending the two. Hosea's references to sexual acts being metaphors for Israelite 'apostasy'. Hosea 13:1-3 describes how the Israelites are abandoning Yahweh for the worship of Baal, and accuses them of making or using molten images for 'idol' worship. Chief among these being the image of the bull at the northern shrine of Bethel. which by the time of Hosea was being worshipped as an image of Baal. Like Amos, Hosea elevated the religion of Israel to the altitude of ethical monotheism, being the first to emphasize the moral side of God's nature. Israel's faithlessness, which resisted all warnings, compelled Him to punish the people because of His own holiness. Hosea considers infidelity as the chief sin, of which Israel, the adulterous wife, has been guilty against her loving husband, God. Against this he sets the unquenchable love of God, who, in spite of this infidelity, does not cast Israel away forever, but will take His people unto Himself again after the judgment. 1 2 Cook, Stephen L., Harper Collins Study Bible; New Revised Standard Version With the Apocryphal? Deuterocanonical Books Student Edition (San Francisco: Harper Collins Publishers, Meeks, Wayne A. ed., (1989), pg. 1193. ↑ Mays, James L. (1969). Hosea. SCM. p. 28. ↑ Ben Zvi, Ehud. 2004. "Observations on the marital metaphor of YHWH and Israel in its ancient Israelite context: general considerations and particular images in Hosea 1.2." 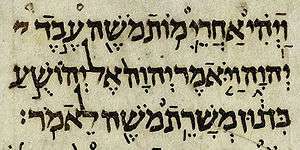 Journal for the Study of the Old Testament 28, no. 3: 363–384. ↑ Connolly, Tristanne J. 1998. "Metaphor and Abuse in Hosea." Feminist Theology no. 18: 58. ↑ Connolly, Tristanne J. 1998. "Metaphor and Abuse in Hosea." Feminist Theology no. 18: 60. ↑ Coogan, Michael David Coogan, A Brief Introduction to the Old Testament: The Hebrew Bible in Its Context (New York: Oxford University Press, 2009), 265.